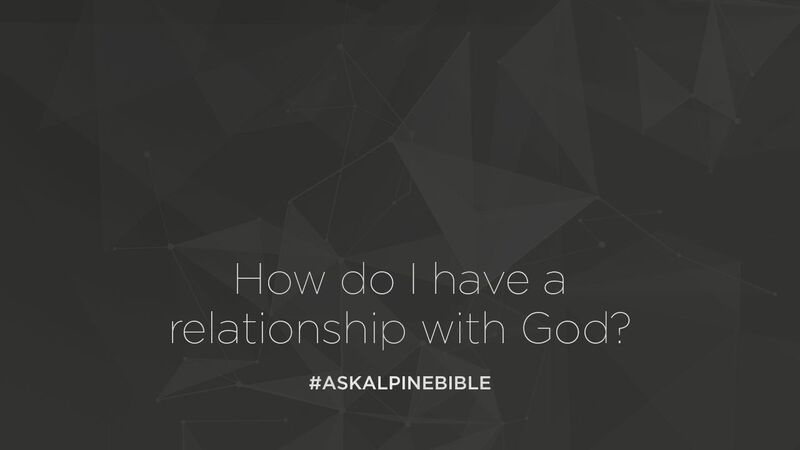 Just want to take some time, with you, to explain one of the most important questions that we could answer for you in your relationship with God and that’s just simply answer the question, how do you know you have a relationship with God? This is foundational for what life is all about. If God created you for his purpose and his reason, to know him would help you understand the reason for which has created you, and to enjoy the reason for which you were designed in him, and that relationship through him. You’ll see in the Bible in John 7 it says, “this is eternal life that you may know him.” Eternity is about knowing him. In fact, the Apostle Paul said in Philippians 3:10, he said, “that I may know him.” His life pursuit was to know him. When God made us, in the beginning, in the book of Genesis, in the Garden of Eden, he said he created us in His image, in Genesis 1:26-27. And in Genesis 2:7 he says he breathed into us the breath of life and man became a living being. He made humanity different then he made any other creature. He made us on the last day and after he designed all of creation he said it was good, but when he made man, he said it was very good. Creating us in His image means God has given us a way to respond back to him and reflect to him as Creator over his creation. We can relate to him and understand him. God made us in His image, in order for us to communicate with him and to him. You, being a creature created in His image, means that you understand capacities through which the way God has made you. In areas such as love, grace, goodness, gentleness, peace, and mercy. God carries those same characteristics and so you can relate to him. Now the conflict comes in us and our relationship with God through something that we call sin. The Bible even go so far as to say that sin has separated us from God. Sin, the Bible uses this word for death. It tells us in Romans 3:23, “for all have sinned and fallen short of the glory of God.” And then the Romans 6:23, “for the wages of sin is death.” Death doesn’t mean just ceasing to exist. What death actually means is separation. Anytime you ever experience sin in any relationship that you have in this world, you know that it divides those relationships. You don’t feel as close as what you did before. In fact, the Bible go so far as to say the wages of sin is death. Now, man’s response, in our separation from God, has been a few. One, is we tried to create religion. Religion is man’s performance to come back to God to show our worthiness to him. But the reality is the Bible tells us in Romans 3 and Galatians 3 that that is impossible. Because no matter how good you do, you can never undo the wrong that you’ve done. Our sin has divided us from God and religion, though it’s efforts are to try to reconcile that, can never undo the wrong that we’ve done against God. In fact, Adam and Eve tried it in the beginning of the garden. When they against God, the Bible tells us they ran and they hid from God, they clothed themselves in fig leaves. But the truth is, for you, the story doesn’t end there, and that’s what is so important and that’s what the gospel is. The word gospel means, “good news.” You couldn’t reconcile yourself to God, and therefore that’s why Jesus came. Jesus came as God in the flesh to reconcile you to him, when you couldn’t do it yourself. That’s what grace is all about. In fact, if you were to read Ephesians 2, it’s a very important passage in the way God lays it out. It starts in Ephesians 2:1, and it tells us that we can’t reconcile ourselves to God. We’re dead in our trespasses. But in Ephesians 2:8-9 it says something very important, “for by grace are you saved through faith, and that not of yourselves, it is the gift of God, not of works, lest any man should boast. God didn’t create you primarily to do. God created you primarily to know him. God created you for relationship. It’s through that relationship with him that you reflect his goodness into this world. As he loves on you, you can love on him in return. In religion, we get that cart backwards. We put the cart before the horse. We try to prove our worthiness to God, when God has already made you a creature in His image. And we can never reconcile that wrong, but God has reconciled it for us. He has been pursuing you for relationship for him. That is the primary reason God has created you: for relationship with him. Now that you know God, now that you understand the reason that you’ve been created in him, now that you have that relationship in him, now you can reflect the beauty of His glory in this world. There’s nothing you can do for God that he can’t do for himself. There’s nothing you’re going to do that’s going to make God love you more and there’s nothing you’ve done that’s going to make God love you less. God has created you in His image and he loves you. So much that he’s become flesh and died for you. God wants you to enjoy that relationship with him for eternity. It’s why he’s created you. It’s why he’s extended it to you, and he wants you to experience that journey with him. Thank you for taking the time to listen. I hope you enjoy your relationship with the Lord and continue to trust in him as his desire is for you to grow in him and through him. God bless you.